Red Sox pitcher Chris Sale, 2017’s leader in Box-Toppers points, also was the season’s leader in strikeouts. Six of the 10 leaders in strikeouts in 2017 were among the top 10 pitchers in their league in Box-Toppers points. All 10 strikeout leaders were among the overall top 100 players in Box-Toppers points. Overall RBI leader Giancarlo Stanton of the Marlins (132) ranked second among National League batters in Box-Toppers points with 14.2. Giancarlo Stanton of the Marlins led all players in home runs in 2017 and ranked second among all batters in Box-Toppers points for the season. Four of the top 10 home run leaders in 2017 are among the overall top 100 players. Corey Kluber of the Indians had the lowest earned run average of any pitcher in 2017 and ranked fifth in Box-Toppers player rankings. The overall Box-Toppers points leader, Chris Sale of the Red Sox (25.1), finished sixth place in ERA (2.90). Eight of the top 10 ERA leaders finished in the top 10 in Box-Toppers points in 2017. Five of the top 10 players in batting average for 2017 are among Box-Toppers’ top 100 players. But two of the top 10 on the list were not even among the top half of players in 2017, including the overall batting average leader, Jose Altuve of the Astros, who ranked 387th among players in 2017 with just 2.5 Box-Toppers points. 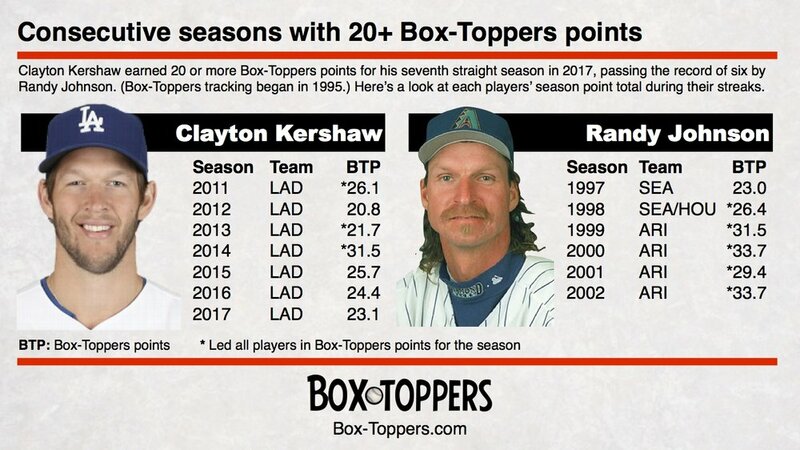 Dodgers pitcher Clayton Kershaw rose to third place in Box-Toppers’ overall “all-time” list in 2017, becoming the active leader in career points. Also in 2017, Albert Pujols became the “all-time” leader in career Box-Toppers points among batters and Zack Greinke rose into the overall top 10 in career Box-Toppers points since 1995. Randy Johnson leads Box-Toppers "all-time" career top 100 list, since record-keeping began in 1995. Clayton Kershaw, ranked third overall, leads all active players. And Box-Toppers 2017 Player of the Year Chris Sale makes the biggest jump up the top 100 chart. Box-Toppers points leaders took home three of the six major postseason awards in 2017 as voted by baseball writers—both Rookie of the Year honors and the NL Cy Young Award. Yankees pitcher Luis Severino had the biggest improvement in Box-Toppers point totals from 2016 to 2017, and is this season’s Box-Toppers’ Most Improved Player. Severino had 19.1 more Box-Toppers points in 2017 than he did in 2016. In 2016, he had 2.0 Box-Toppers points and in 2017, he had 21.1 points, seventh among all players, fourth among American League pitchers. Giancarlo Stanton of the Marlins, who ranked second among National League batters in 2017 Box-Toppers points, was named NL Most Valuable Player Thursday. 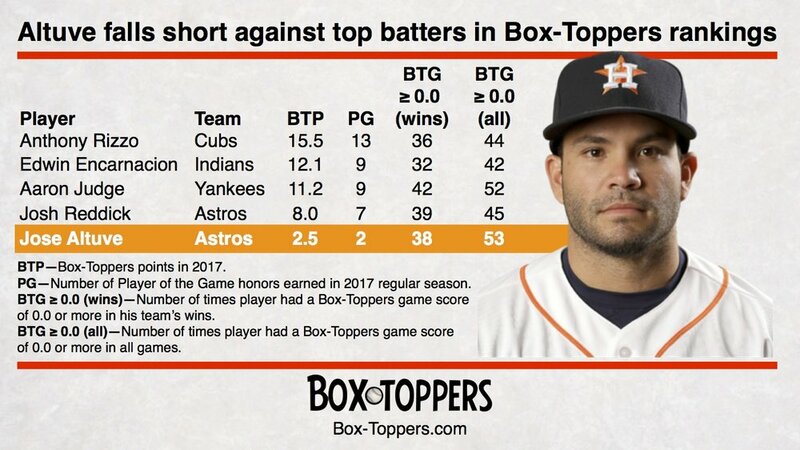 But Jose Altuve of the Astros was named American League MVP despite his low Box-Toppers rankings—with just 2.5 Box-Toppers points on the season, he ranked 90th among AL batters and 387th among all players. Nationals pitcher Max Scherzer, who led all National League players in 2017 Box-Toppers points, was voted NL Cy Young Award winner Wednesday. However, Box-Toppers overall top player, Red Sox pitcher Chris Sale, finished second in voting for the American League Cy Young Award. He lost to Indians pitcher Corey Kluber, who ranked second among AL pitchers in Box-Toppers rankings, fifth overall.